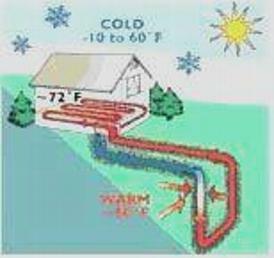 Geothermal energy represents the leading edge of heating and cooling technology. Compared to ordinary systems, geothermal technology can save you 50% to 70% on your monthly energy bills. That's because it has an efficiency rating of up to 500%. Not only are conventional electric and natural-gas based H.V.A.C (heating, ventilation and air-conditioning) systems inefficient when compared to geothermal systems, they are also present significant safety risks to you and your family, and are hazardous to the environment. Geothermal H.V.A.C systems have no fumes or dangerous leaks - they have no way of emitting poisonous carbon-monoxide as well. Not only do they keep your indoors safe and clean, they are 100% environment-friendly. In fact, the refrigerant used in geothermal equipment meets future government standards and is non-toxic. Given their efficiency, geothermal systems completely re-pay their initial installation cost within a matter of years - the amount of money that you will be saving each month will be very significant. Our clients have enjoyed unthinkably low energy bills during both the coldest and hottest months of Chicago land weather. Geothermal systems are simply the safest, cleanest most cost and energy efficient H.V.A.C systems available today. Continue on to the other sections of our site to learn more about how the system works, the types of equipment offered, and more. "Geothermal energy is a bi-directional energy source that can be used for both heating and cooling. When using geothermal energy for cooling in the summer heat pumps are used to extract the hotter air from the house so that it can be cooled in the earth. In the winter the outside air is colder than the ground temperature and so the heat exchanger in the heat pump can move the heat from the ground into the house or building."